The Deferred Action for Childhood Arrivals program, which allows young undocumented immigrants to stay and work in the United States, is "being rescinded," Attorney General Jeff Sessions said Tuesday. The decision to do away with DACA drew scathing criticism from some Bay Area politicians. "President Trump’s decision to end DACA is a deeply shameful act of political cowardice and a despicable assault on innocent young people in communities across America," House Minority Leader Nancy Pelosi said in a statement. "Deporting DREAMers means destroying the lives of hundreds of thousands of patriotic young people, costing the economy billions and betraying the fundamental values of the American Dream." Rep. Barbara Lee, who represents the East Bay, took to Twitter, writing, "Ending #DACA is cruel and heartless. Congress must act now to protect #DREAMers and pass comprehensive reform once and for all." 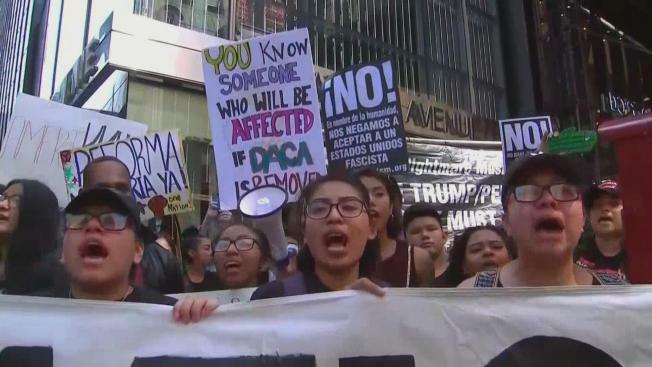 DACA has given approximately 800,000 young undocumented immigrants, also referred to as "dreamers," the opportunity to stay in the country and work legally in the U.S. in the form of two-year, renewable work permits. The state with the highest amount of DACA recipients benefiting from the program is California, according to data analyzed by the Pew Research Center. The government will stop processing new applications under the Obama-era program, but the Trump administration is giving Congress six months to come up with a legislative fix before the government stops renewing permits for people already covered. California Sen. Scott Wiener, who represents San Francisco, joined Pelosi and Lee in condemning the decision, arguing that President Trump is "going after immigrant children." "Ending DACA is a disaster that will only serve to tear families apart and stoke fear and distrust in our immigrant communities," part of Wiener's statement read. "Trump’s odious immigration policies expose him for what he is – a divisive, destructive nativist with no concern for the well-being of the people who live in this country." San Jose Mayor Sam Liccardo also blasted the announcement, but vowed to support DACA recipients in San Jose. "The Attorney General's announcement of the Trump Administration's rescission of DACA abandons 800,000 of America's hardest-working, most patriotic residents," a portion of the mayor's statement read. "Punting the issue to Congress, without any affirmative leadership to enact a legislative solution, amounts to a cowardly cop-out, placing the futures of these young women and men in serious jeopardy." Aside from taking to social media or issuing written statements, a number of Bay Area politicians addressed the DACA decision at Tuesday news conferences. In the South Bay, Santa Clara County leaders scolded President Trump for showing a cold heart to DACA recipients. "I, like many here, are not surprised that the President of the United States took the moral compass of his country and once again threw it to the ground," Santa Clara County Supervisor Cindy Chavez said. Fellow supervisor Dave Cortese added that the county will consider legal action against the federal government as well as continue to fight for the roughly 24,000 DACA recipients in the region. "I urge every 'dreamer' out there affected by today's decision to remain resilient and hopeful," Cortese said. "That's the American way. That's the Silicon Valley way. And that's absolutely the Santa Clara County way. And we will not go down without a fight." A slew of South Bay leaders gathered a short time later and pledged their continued support for those impacted by DACA while recipients of the program themselves spoke out about the program's benefits during a rally outside the Martin Luther King Library in San Jose. In San Francisco, immigrant, civil rights and faith groups gathered at an 11 a.m. news conference at city hall to "condemn the President's cruel and unjust decision." Later in the day, Mayor Ed Lee criticized the Trump administration's decision, saying that they "turned their backs on these young people."